We started the spring 2011 season on April 10 with a Train the Trainers session for a May 21 BikeSChOOL session at the Farmers’ Market to teach bicycle riding without training wheels. 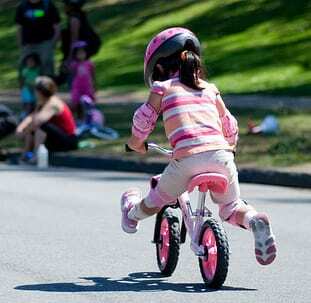 About 50 children learned to ride bicycles without training wheels. Read more on our blog post We Teach Kids to Bike and see a slide show. One of the WWBPA goals was to develop a bicycle and pedestrian safety curriculum for students and adults. We’ve made significant progress in this area, including: a bike safety event at Millstone River School, a train-the-trainer program given by Bike New York, and a Bike Safety Training. The WWBPA, aided by students from Millstone School and WW-P High School South, talked about bicycle safety to more than 300 fourth and fifth graders at Millstone’s student environmental fair on. Students proved they know the difference between well-fitted and poorly-fitted helmets, practiced hand signals to show a rider’s intent, and learned about the best ways to be visible at dusk and at night. Dozens of students signed a petition asking Plainsboro officials to develop safe routes for them to bike to school. The training was for PE teachers of 4th grade through High School.